He fainted on me. Big bloke, my local guide on Nauru, who in the sunbaked heat took me Topside on the island to steal a look at the refugee camp among the scraggy rocks known as the pinnacles. And down he went. Nauru was happy for reporters to visit the country then. In 2013, I was one of the last foreign journalists to travel to Nauru in the weeks before the effective ban was imposed with an $8000 charge for a visa application – a fee for a right to apply, not a right of entry. Yet even then, Australian officials running the camps didn’t seem too happy to see journalists poking around. When my guide passed out, I rang for an ambulance. Now awake, if groggy, my guide leant on me as a crutch, struggling back to the road to meet the help, explaining that he’d donated blood that morning and not eaten afterwards. Alongside the ambulance pulled up an irate bevy of Australian immigration officers. As the local paramedics loaded my guide into the back of their vehicle, all the Australians wanted to do was lecture me. The area on Topside where the phosphate mining still continued fitfully was out of bounds, they said, I shouldn’t be there. Maybe they had a point. But nor were the local rules theirs to enforce, and besides, the Nauru police didn’t object to my presence, and when I later asked the media contact in the Nauru Government, she was perfectly happy for me to explore. Yet I’d spoken with the then head of Nauru’s prison at the same spot only a couple of days beforehand, hearing about the almost 120 asylum seekers who were ferried to the lock-up after a violent and dangerous riot at the camp. 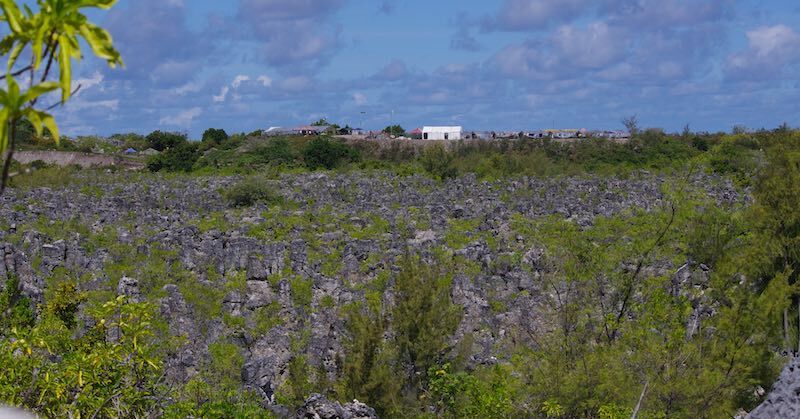 Nauru’s government was more than happy to have that story told – after all, the riot had caused $60 million damage and terrified some of the locals. I’d gone back to film a piece to camera. But the overzealous Australian had his own view of the rules. These are only personal stories, nothing more. A bit of tension with officials when on the job reporting is hardly news. But I got thinking about the experiences I had when it emerged on Monday that the Nauru Government has banned the ABC – explicitly, the ABC – from travelling to the country to report on the Pacific Islands Forum. Nauru has only permitted a few media visits in recent years, and will only allow three journalists from each of the Pacific Islands Forum nations onto the island for the September meeting. Logistical reasons are doubtless part of the decision – when I was on the island, the main hotel was a collection of converted shipping containers, crammed with Australian officials, and I was lucky that a friendly local allowed me to sleep in a bungalow and rent a car. But mostly, the decision to black ban the ABC is the latest manifestation of a belligerent attitude Nauru has adopted towards the Australian and foreign media, and an authoritarian approach to information in general. Opposition MPs faced suspension from parliament for giving interviews to journalists overseas; Facebook was banned in the country; and the local media censored. The Nauru Government has responded to reporting about asylum seekers on the island and maladministration in the country by practising a strategy of distraction, haranguing journalists for supposed fake news long before US President Donald Trump appropriated the term. To shoot the messenger, as the old saying goes. For its part, the Australian Government has consistently disavowed any involvement in Nauru’s media crackdown, noting it has no control over the country’s sovereign decisions. This is right. It is this same Nauruan sovereignty that Australia relies upon as the basis for its policy of deterring asylum seekers. But what Australia can control is its own response. Prime Minister Malcolm Turnbull on Tuesday described Nauru’s decision “regrettable”, but said “that is a matter for Nauru”.
.@TurnbullMalcolm: It'll be regrettable not having media at the Pacific Islands Forum, but we must respect Nauru's sovereignty to determine who comes into their country. We support press freedom, but it is a matter for Nauru. Australia could choose to exercise its own sovereignty, to stand up for principle, to consistently defend freedom of the press as central to the liberal standards that are otherwise so widely said to be under threat. After all, the dangers supposedly encroaching on the Pacific from authoritarian China have been a theme of recent reporting in Australia. Instead, the government has spoken volumes by saying next to nothing. It might be Nauru’s decision, but Australia’s preference is abundantly clear.